Half of the 200 indigenous languages spoken in Australia before the British arrived have died and fewer than 20 are being taught to the next generation. But Katrina Power is one of those busy bucking the trend. More than just words, ‘our language is linked to our land,’ say Kaurna Elders. 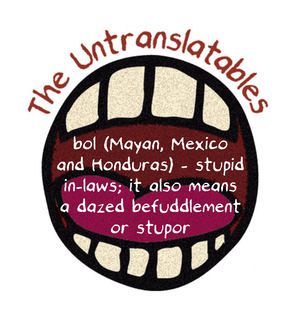 bol (Mayan, Mexico and Honduras) - stupid in-laws; it also means a dazed befuddlement or stupor. The 'Untranslatables' are taken from The Untranslatables by C J Moore.